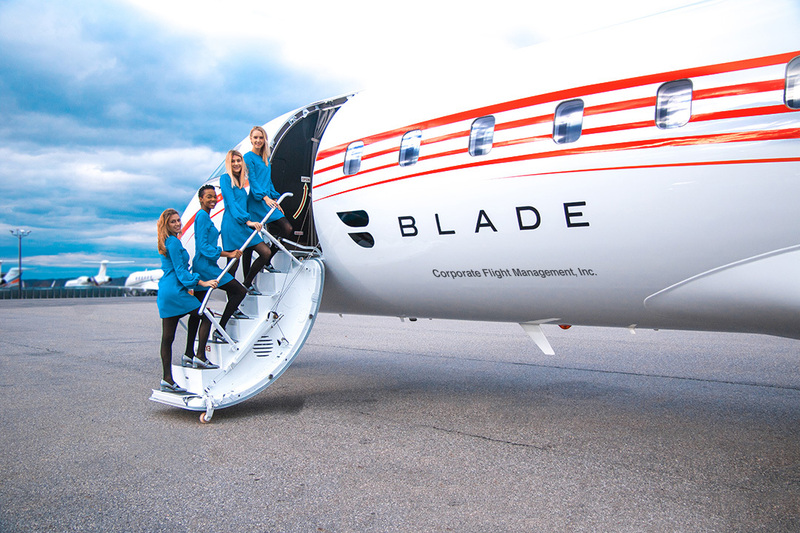 BLADEone jet service flies between Manhattan and Miami on Thursdays, Fridays, Sundays, and Mondays, plus additional flights over the holidays. The jet is a retrofitted Bombardier CRJ 200; typically configured to accommodate 60 passengers, masterfully reimagined to only seat 16 fliers. A commercial aircraft retrofitted from 60+ seats to 16. 1 seat per side of cabin–enjoy privacy or socialize. BLADE Lounge Miami: Enjoy cocktails or pre-flight meals. Fly from BLADE Lounge West or BLADE Lounge Miami. Depart from Manhattan's BLADE Lounge West on a 15-minute helicopter flight, or directly from Westchester Airport, where there is complimentary onsite valet service. Arrive rested and relaxed to BLADE Lounge Miami at the Opa Locka Executive Airport, the closest private airport to Downtown Miami and South Beach. 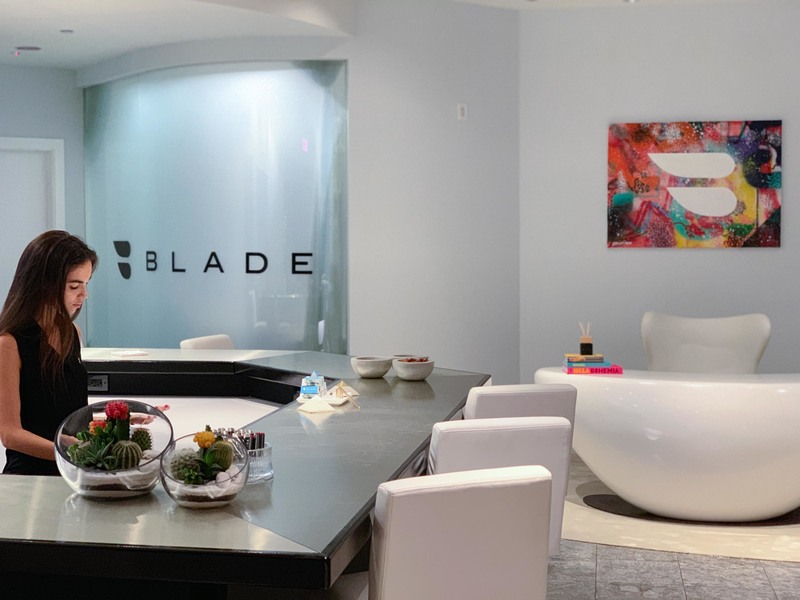 On the return, BLADEone departs directly from BLADE Lounge Miami, landing at Westchester airport where you can disembark, or available helicopter transfers can take you back to Manhattan with your baggage. Guests enjoy a beautifully designed interior, complete with full in-air service by two BLADE Sky C/X cabin attendants. World-class cuisine, preloaded iPad Pros with first-run movies, and specially-designed Dopp kits with next generation personal care products complete the experience. We understand some people prefer to rest during their flight, so on return flights to Manhattan, passengers may elect to dine in the Lounge with a glass of rosé. BLADEone is a Bombardier CRJ 200 that we exclusively use for all our southern Florida flights. This jet utilizes a unique configuration, allowing every passenger to enjoy a club chair with ample leg room and direct access to the aisle. BLADEone allows fliers to enjoy all of the amenities of the most uniquely appointed aircraft in the industry. No detail is overlooked. No reasonable request is denied. Dogs are allowed on the BLADEone jet. Each dog over 50 lbs requires prior notification and the owner to purchase an additional seat. All fliers purchasing two roundtrip BLADEone seats will receive a complimentary room for the weekend at Faena Hotel Miami Beach. All fliers are invited to enjoy our new BLADE Lounge in Miami – the very first private jet passenger lounge at Opa Locka Executive Airport. All flights land and depart directly from BLADE Lounge Miami. A full bar, work, and dining areas are available to all passengers departing and arriving on BLADEone, as well as onsite shower facilities. BLADE C/X members are always onsite to assist with your needs. Departing passengers from Miami also may dine in the Lounge up to 20 minutes prior to flight time if they do not wish to dine onboard. Two members of the BLADE Sky C/X team fly aboard each flight to make fliers' journey as consistent and comfortable as possible.